If you have a pension plan at work, you are likely at some point to face a choice: Do you want everything now in one lump sum payment? Or would you prefer instead a monthly income check for life? It feels like a game show question. Behind door number one is a pile of cash. Behind door number two, a guaranteed X amount of dollars every month, for life. One obviously must be a better deal, right? Not necessarily. It's actually more of a matter of preference. It will depend on your personal circumstances and the offer that is made, and the specifics can vary. Before making a decision, it helps to discuss your options with a trusted financial professional. Do You Consider Yourself a Good Money Manager? If you take a lump-sum payment, you have the freedom to invest the assets as you please. If you want to get aggressive, go for it. Maybe you'd prefer a more balanced approach, or only value stocks, or REITs, or gold ETFs — it's up to you. If you simply put the money into a broad-market index mutual fund, you could keep pace with the market while keeping annual fees low. Compare that with a monthly annuity that may adjust annually with inflation but otherwise remains steady. Move a lump-sum payment into a rollover individual retirement account (rollover IRA) and the investments will remain tax-deferred. Investors are not required to take minimum distributions from IRAs until age 70 1/2. In down-market years, those dependable, inflation-paced annuity payments may start looking pretty good. Some people can take the uncertainty of market volatility because the upside seems worth it, others can't bear the downside. To be sure, there is a risk to principal during years when investments underperform. This is a two-pronged question. How many years do you have until retirement and how much time do you have to live? Timing and longevity are both important factors in deciding between a lump-sum or annuity. Take the first question: how many years do you have until retirement? If you have 20 or more years before clocking out for good, you have the opportunity to leverage your pension and build more savings. Managed well in a tax-deferred investment account, a lump-sum is more likely to result in a larger payout over time. Today's regular income payments, on the other hand, may look pretty paltry in the future. The next question is how much time do you have to live. Most of us have no idea, but you can get a good estimate from the age of parents and grandparents, as well as your general health and fitness. The longer you live the smaller the guaranteed annuity payments will seem. To maintain your standard of living for up to 30 years in retirement, it may be necessary to adopt a more aggressive investing strategy. Is the Offer a Fair One? Beware, there are companies that will try to take advantage of employees, offering early retirement payouts that are worth significantly less than their promised pension benefits. 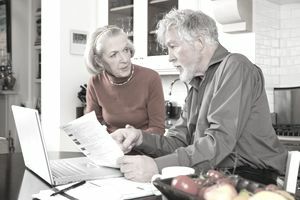 Employees faced with early retirement or buyout offer should take the time to consult a trusted professional before making a decision. Should You Take A Lump Sum or Pension?